I couldn't believe it when I heard it. 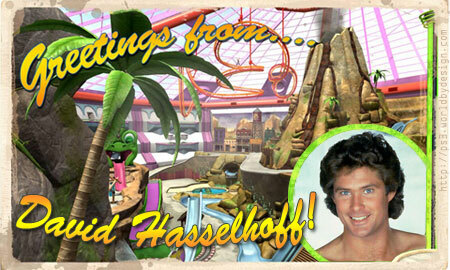 The legend that is David Hasselhoff will be a downloadable character in the new add-on for PAIN! The new expansion pack "Movie Studio" should be available to download on 6th November - which Sony have now christened 'Hoff Day'. As well as being able to fling the Hoff face first into movie related props and sets, he has recorded his own version of 'Do You Really Want to Hurt Me?' - originally by Culture Club. There are apparently three launcher locations in this level, more explosives fun, the unlockable Buzz character from the 'Buzz!' quiz games and the usual bowling and other gameplay modes. It sounds like Idol Minds have made a good followup to their previous level expansion pack, the 'Amusement Park'. More info from the man himself and some screenshots are available from the official US PlayStation Blog.